CURIOSITEA ENCOURAGES EXPERIENCED PROFESSIONALS AND STUDENTS TO SHARE A TEA-TIME FULL OF INSIGHTS AND EXPERIENCES WITH MOTIVATED PROFESSION-SEEKERS. CuriosiTea will work as an online platform, connecting those seeking with those who have found a profession. 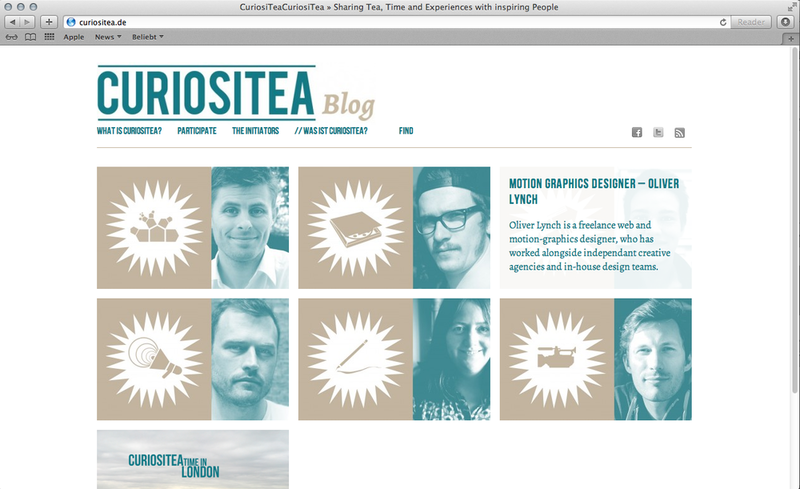 Showcasing inspiring examples of CuriosiTeas with people from different professions. Helps you organize CuriosiTeas and Work Shadows more easily. — we are still looking for feedback and people to join the team! 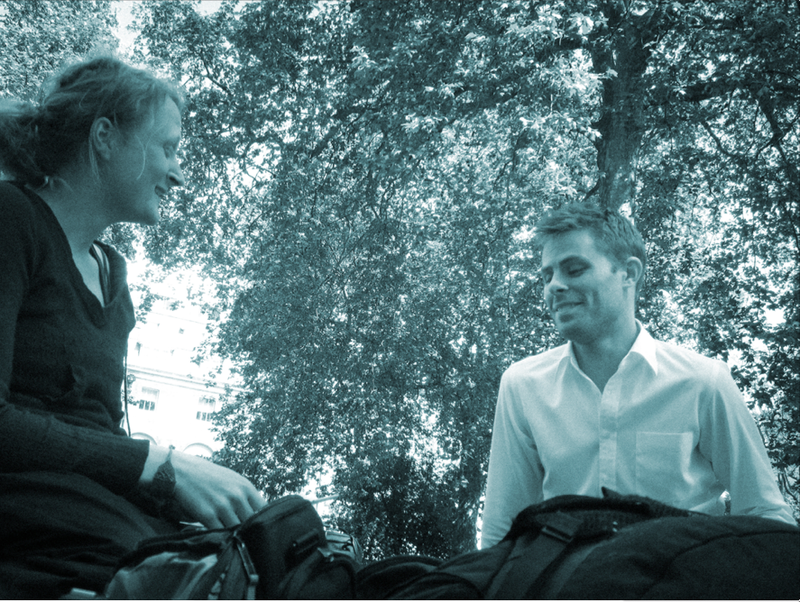 Testing the idea with UK/US-based Documentary Filmmaker Tristan Copley Smith. Asking London based Illustrator Harriet Russell about her work over a cup of tea and biscuits. with Open Source Designer and Architect Alastair Parvin. Sending personal "Thank You" cards to all the nice people who shared their time and insights with me. 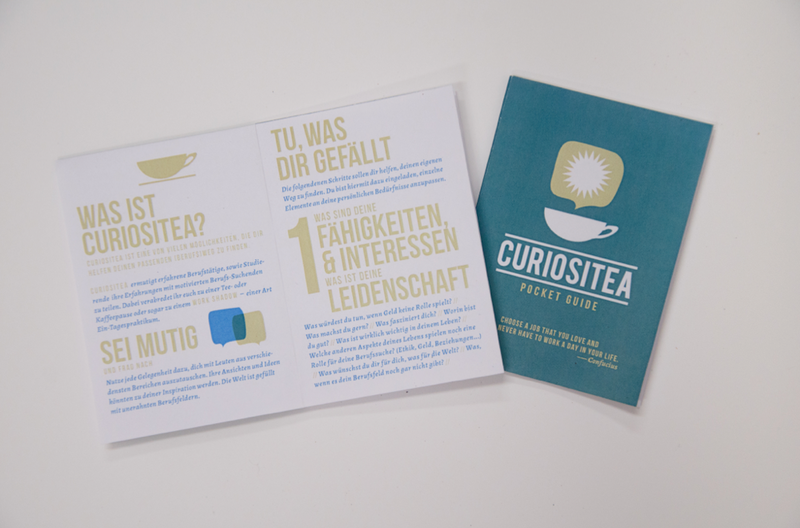 Proud to see CuriosiTea nominated for the Giebichenstein Design Award for Most Ambitious Project. 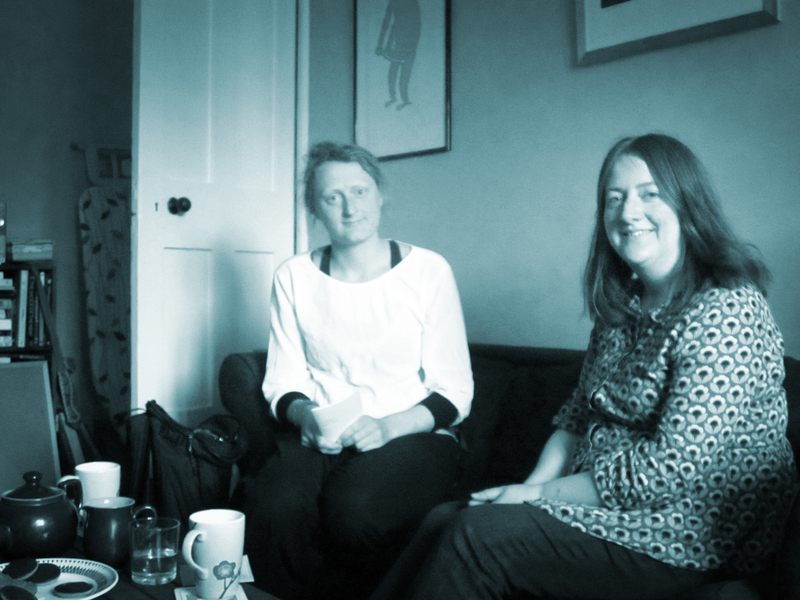 During a CuriosiTea the person you are visiting can share their insights and experiences with you, answering all of your questions related to their profession over a cup of tea or coffee. 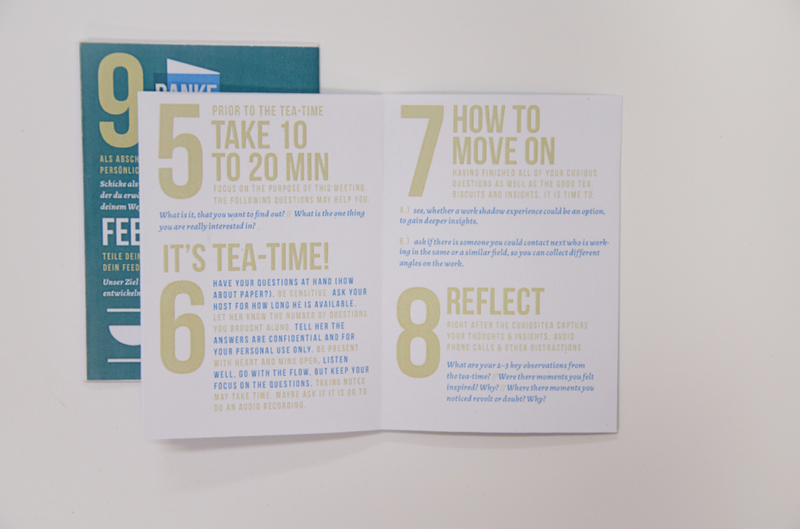 Each tea-time offers the chance to ask for a referral, so that after the first CuriosiTea, you can follow a second one, or even a Work Shadow. During a Work Shadow you accompany a person at work. That way, you gain direct insights into what fascinates you. In doing so, you act as an unobtrusive shadow. Work Shadows have been a common practice in the US and the UK for a while, but for some reason have not taken off in Germany and other European countries, yet. CuriosiTea is also the name of the platform we are building. This platform shall connect those seeking CuriosiTeas and Work Shadows with those offering them. Our goal is to create a more personal extension to the digital information paths that exist so far. 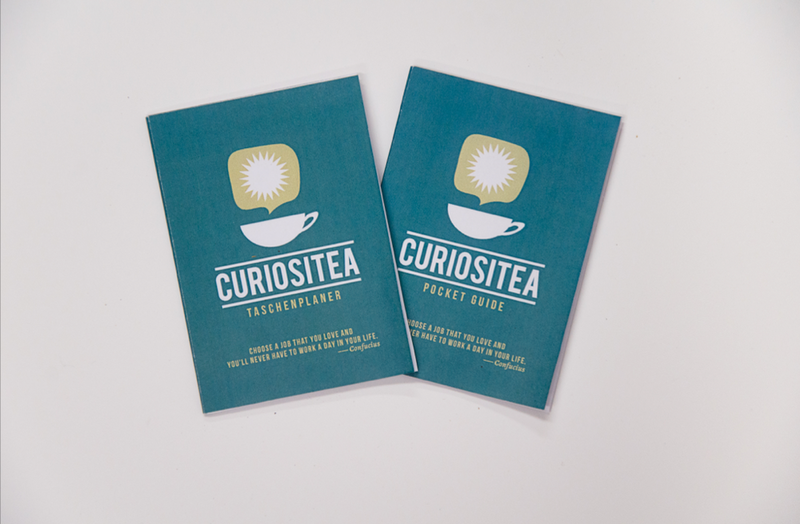 To help CuriosiTea-participants recognize one another, there will be a badge, that can be attached to the website or printed out and displayed on a store front window. For us, this is not about profit, no, it is simply about offering you the possibility to become a bit happier or at least more content in the choice of your professional life path.